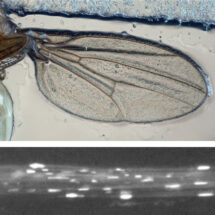 Transparent fruit fly wing and image of mitochondria in a bundle of nerve cells within it. Ageing is characterised by a decline in function at both the cellular and organismal level and is the major risk factor for several neurodegenerative disorders, including Alzheimer’s and Parkinson’s disease. One of the key cellular processes that is affected during ageing is the transport system that nerve cells use to deliver components to different locations. Transport within nerve cells is driven by ‘molecular motors’, remarkable proteins that bind to cargoes and drag them to their destination by walking along filaments in the cell. It has been proposed that boosting transport could help counteract neurodegenerative diseases although until now it has not been clear if, and how, a decline in transport can be reversed. Alessio Vagnoni from Simon Bullock’s group in the LMB’s Cell Biology Division set out to answer these questions using fruit flies (Drosophila). These animals are widely used to model human cell biology and disease due to their rapid life cycle and the ease with which genes can be manipulated. Furthermore, the use of Drosophila can reduce experimentation on mammalian model organisms such as mice and rats. Alessio labelled mitochondria, the energy-creating powerhouse of cells, with a fluorescent tag and filmed their transport in nerve cells within the translucent wings of immobilised adult flies. Using genetics and by feeding flies specific chemicals, Alessio was able to shed light on how transport in controlled in flies of different ages. 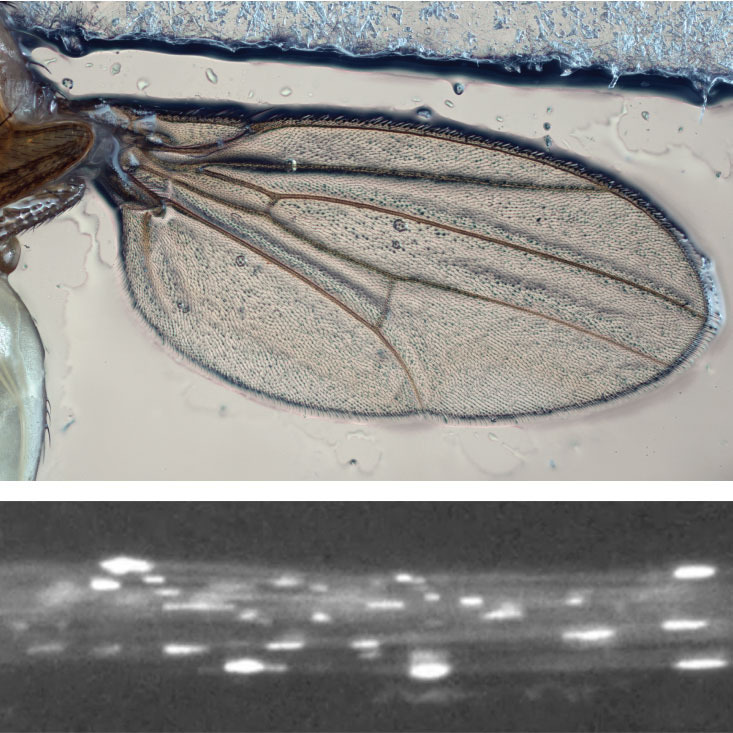 This work revealed that activating a protein called PKA in old flies is sufficient to restore the level of mitochondrial transport to that observed in much younger flies. In some experiments, this was achieved simply by feeding a chemical that activates the protein. It was also found that the level of a key motor protein declines during ageing and that activating PKA stimulates transport, at least in part, by increasing its abundance. The proteins studied in this work are found in humans and at least some of them are affected in post-mortem brains of individuals affected by Alzheimer’s disease. This work opens new avenues for attempting to manipulate transport in a therapeutic setting. However, more work is needed to investigate the direct relevance of the findings in flies for ageing and degeneration of mammalian neurons. This work was funded by the MRC, a Van Geest Fellowship in Dementia and Neurodegeneration and a National Centre for the Replacement, Refinement & Reduction of Animals in Research (NC3Rs) David Sainsbury Fellowship.